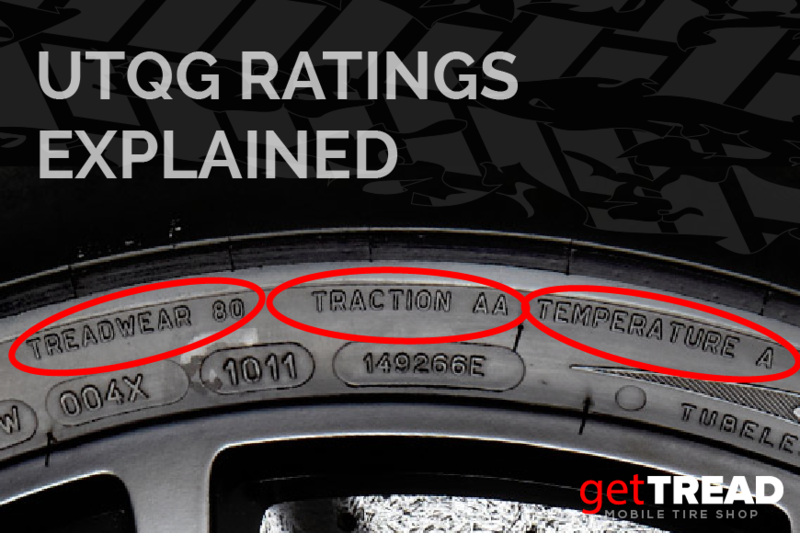 Tire manufacturers publish UTQG (Uniform Tire Quality Grade) ratings to help consumers understand the potential performance of a tire, based on 3 things. Treadwear, Traction, and Temperature. The one thing to note hear is, the individual tire manufacturers (like Michelin, Bridgestone, Pirelli) grade their own tires, based on comparison with a their own standardized control tire. All tires are tested on a 400 mile test road in West Texas for 7,200 miles. The wheel alignment, air pressures, and tire rotations are done as consistently as possible. They then measure the treadwear and come up with a calculation on how long the tread will last. However, it’s currently not 100% appropriate to compare two tires from two different manufacturers directly, because they are essentially rated according to slightly different scales (like we mentioned earlier, each manufacturer sets up their own standard control tire to measure against). Nevertheless, all manufacturers are required to displays their tire’s ratings on the tire sidewall, and it’s something they can use to advertise their tires. It shows a UTQG of 680 A B. Now, to find out what those numbers mean, let’s dig a little deeper. Treadwear rating is designed to let the consumer know roughly how long the tire tread with last (in miles) before needing replacement. The tire is measured against a control tire which has a grade of 100. This means that a tire of treadwear rating of 200 should go twice as far before wearing out than a tire with treadwear rating 100. A tire with rating of 80 will have a shorter life than the control tire. The higher the number, the more mileage, the lower the number, the less mileage. This is a measure of a tires straight line wet coefficient of traction, while the tire skids across a test surface. It’s done on a fixtured trailer that skids the tires across wet asphault and concrete test surfaces while measuring the coefficient of friction. The way the test is done, it cancels out any affect of tire tread design, and rather tests the tire’s rubber compound. Traction ratings, from highest to lowest, are AA, A, B and C. AA has the most traction, while C has the least. The last UTQG rating is related to temperature. It denotes how much heat is generated or dissipated by the tire. The test is run by rolling an inflated tire against a giant test drum. The tire is run at high speeds and the temperature is measured. Temperature ratings are A, B, and C. A being the highest (highest speed to manage heat), C being the lowest (lower speed to maintain heat). C is the minimum legal rating for a tire sold in the U.S.
Well, now you know a little bit more about UTQG ratings. Tire testing is quite a complex science. And it’s for that reason why we mentioned that these ratings are difficult to compare (apples to apples) against different manufacturers. But as a rough reference, it’s a place to start if you want to get a basic idea about a tire’s performance potential. For more info on specific tire recommendations for your application, hop over to our tire shopping link. You’ll enjoy less shopping hassle – with our innovative “Driving Style” filter, you can zone in on the best tire for your needs – and of course – we COME to INSTALL! Happy shopping! Book your appointment now and get FREE Balance & Rotation for a second vehicle at the same location!